Medicinal uses: May be used to lower temperature and cool the body. Historically the plant has been used to induce menstruation and can be used to aid difficult births by aiding the expulsion of the placenta. In small quantities it can be used to prevent migraines. It is useful for migraines associated with menstruation and for headaches. The herb can also help arthritic and rheumatic pain (Chevallier 140). Additional uses: The dried flowers can be used in flower arrangements. The fresh leaves and stems produce a greenish yellow dye in wool mordanted with chrome (Kowalchik 193). Cautions: Eating fresh leaves may cause canker sores. 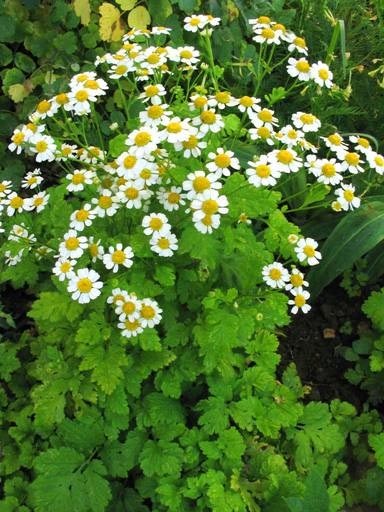 Do not take feverfew if taking warfarin or other blood thinning drugs. Do not take if pregnant or breastfeeding (Chevallier 140).